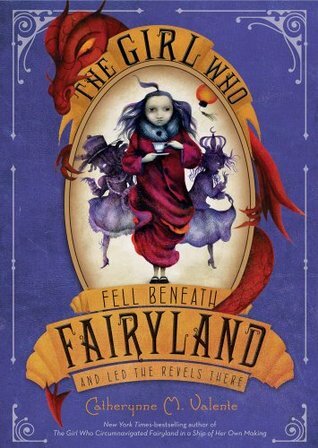 The Girl Who Fell Beneath Fairyland and Led the Revels There did not capture my attention at first. Until I was about halfway through the book, I had to force myself to read it. I think my problem was the information. There was so much detail between the talking and action, which started to get repetitive. Yet, when I got to a certain point, I couldn't put it down. I had to know the ending. As in Catherynne Valente’s first book in the Fairyland series, this installment did not quite end on a cliffhanger, nor did it completely wrap everything up. I will definitely need to read the last book. So at the start of the book we immediately are informed that September, the heroine of this series, is another year older. Now a teenager, she has a heart. A raw, sensitive heart which does not know its own strength. Throughout the story we get to follow September’s heart growing and breaking, from when she has her first kiss to when she is betrayed for the very first time. By the end of the book she has matured a bit, and takes initiative in her relationships. The point of this adventure was to bring the Shadows of September’s loved ones back to their flesh bodies from Fairyland-Below. Because of this, there are a lot of new characters and we don’t see A-through-L or Saturday (her best friends from Fairyland-Above) until the end. When our protagonist reunites with her partners, the book ends on a good note. Despite this book lagging in some parts, when it wasn't slow it was very well written. Things from the previous book and even random little things in this book connected. Valente did a good job pointing out some things younger readers may not have picked up on. Overall, this wasn't my favorite book, but I give it three out of five stars.